After along haul of boggling detail, I’ve completed another icon in the series for the coloring book YE GODS! THE AZTEC ICONS. That makes nine in two years. Only 17 to go. Good thing I’m patient—and persistent. The icon of this popular goddess of drunkenness (as well as intoxication by other drugs), was a lot of fun to draw if only because of all the drunken rabbits. She herself is based on an image from Codex Rios with details from Codex Laud and Codex Nuttall, and the vignettes come from various other sources like Codex Vindobonensis. It was also a rare chance to draw the other hallucinogens: psilocybin mushrooms, Datura and morning glory flowers, peyote cactus, and marijuana leaves. The two little blooming peyotes are drawn from plants I used to have in my greenhouse. The flowers are pink. 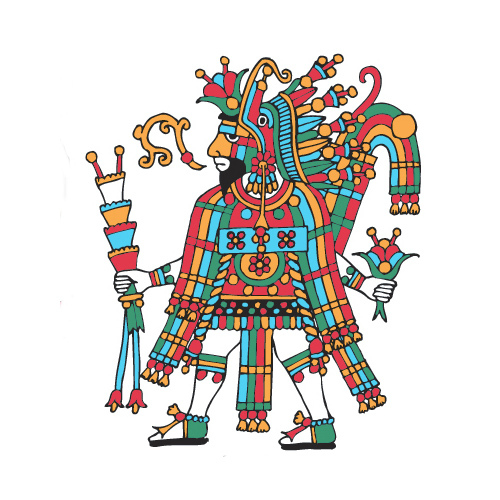 To download this icon as a .pdf file with a page of caption and model images from the Aztec Codices, right click here and select “Save Target (or Link) As.” You can also download it in freely sizable vector drawings from the coloring book page. MAYAUEL is the personification of the maguey plant and a maternal and fertility goddess connected with nourishment. Besides fibers for ropes and cloth, the most important maguey product is the alcoholic beverage pulque (or octli). As a pulque goddess, she is often depicted with many breasts to feed her children, the Centzon Totochtin (400 Rabbits), octli gods that cause drunkenness. (Drinking was generally only permitted in ceremonies, but the elderly were free to drink whenever they wished. There were rabbit deities for all kinds of intoxication.) With the birth-name of Eight Flint, she also protects mature wombs and probably is the wife of PATECATL.